It happens every year in the NFL. From midseason to the closing moments of the playoff weeks, talented but overlooked players begin to rise from the ranks of the unknown to quietly build momentum for promising future careers. Looking for examples? Think about Wes Welker in 2006, Arian Foster in 2009, and Miles Austin in 2008. All of those players were not household names, but showed promising signs in the second half of the seasons before their true breakout year. Even if these sleepers are not stuffing up stat sheets, by looking through the eye in the sky we can begin to dig for diamonds in the rough before the rest of the public gets wise. This week, allow me to introduce you to Mike Brown, a slot receiver who has made the most of his opportunities in Jacksonville. Mike Brown hales from Liberty University in Lynchburg, Virginia known more for its role with the “religious right” than for churning out NFL stars. Brown starred at quarterback from the Liberty Flames, and holds the school record for career completion percentage with 65%. The former quarterback went undrafted in 2012, but signed on with the Jacksonville Jaguars’ practice squad after training camp. It was there that Brown began the conversion from college quarterback to NFL wide receiver. That trick has been tried plenty of times, and for every Antwaan Randle-El there is an Armanti Edwards mega-flop. Which side of the line will Brown fall under? A glance through the eye in the sky shows that, just his second season, Brown has shown some signs that he may be able to make a smooth transition. Once Brown makes the reception he shows off the skills that made him such an explosive running threat as the Liberty University quarterback. The cornerback hesitated enough to give Brown room to make the catch, but returns to his position to try to make the tackle. 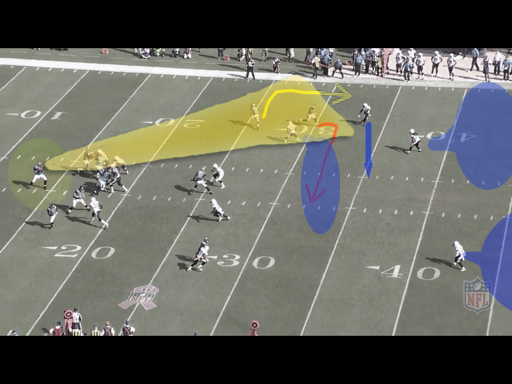 However, Brown shows he has the ability to make defenders miss in tight spaces. Brown’s 5’10” 200 pound frame was far too small to be considered at quarterback, but he brings pretty good size to the table as a slot receiver. He displayed strong run after the catch ability here. 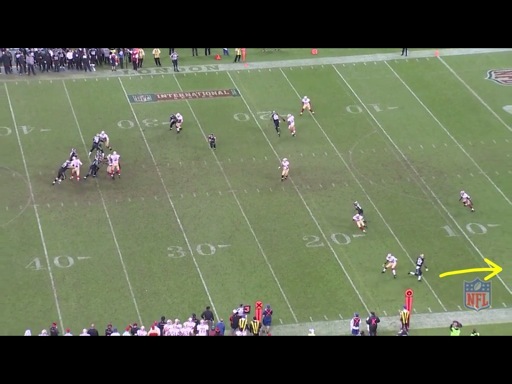 Here you see Brown break on his deep route and come back for the ball. He also shows the athletic ability to go up and meet the ball at it highest point. His strong hands, and ability to make catches in traffic are both great assets. Even if he only ever becomes a reliable slot receiver, Brown will find that almost all catches in the NFL are of the contested variety. 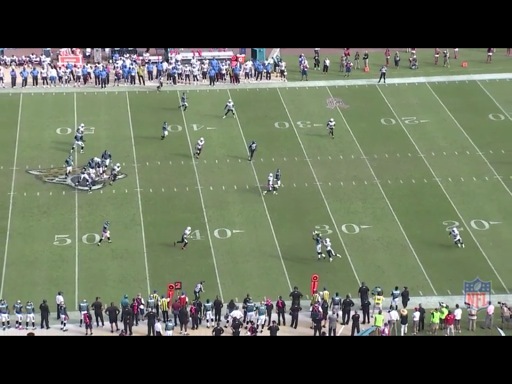 With only two years into his conversion to wide receiver, Brown is pretty advanced to be making these types of plays. Former Panthers bust Armanti Edwards never made a catch like this in his NFL career. As the cornerback comes charging up field in anticipation of the interception, Brown goes streaking past him. 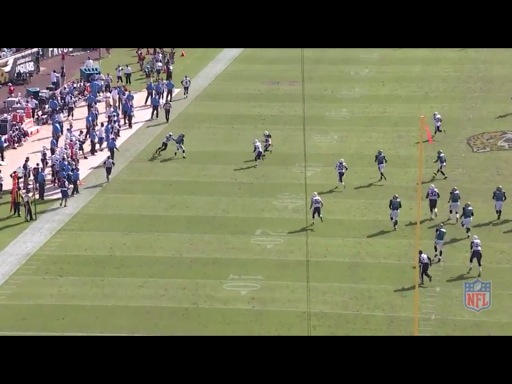 The pass from Henne is already on its way and Brown has a clear path to the end zone. 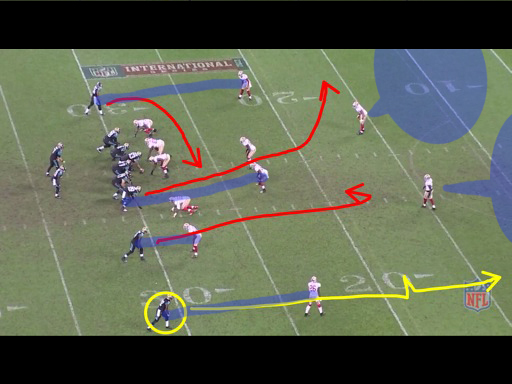 On this play Brown not only demonstrated the capability of winning on the outside, as opposed to strictly in the slot, but also showed awareness beyond his years to fool a cornerback. A great example of Browns athletic prowess and how his quarterback background assists him in deciphering and manipulating coverage. Mike Brown is putting up a nice amount of solid tape in just his second season since converting from college quarterback to NFL receiver. 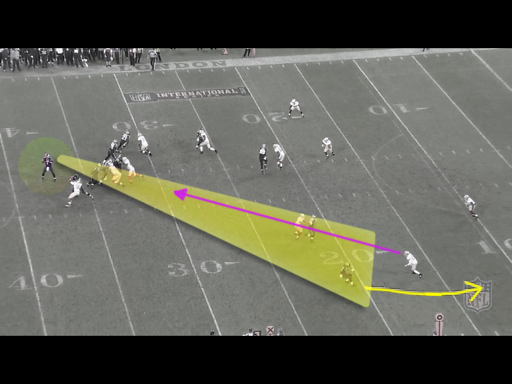 He should only improve on his route running ability, and other intricacies of the receiver position. He has a bright future as a pass catcher at this level. Brown is also fortunate that the Jaguars stable of receivers is currently riddled with questions. 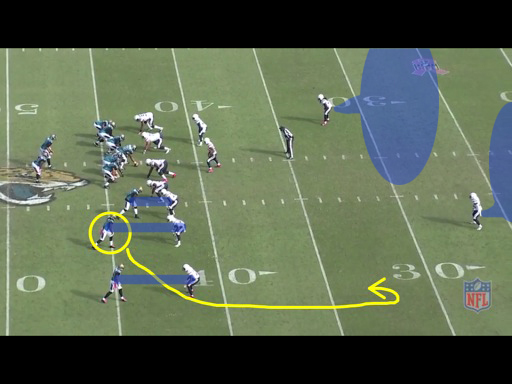 In theory, Jacksonville has a great set of starting wideouts in Justin Blackmon and Cecil Shorts III. With Blackmon and Shorts drawing defensive attention outside the numbers, Brown would be free to own the middle of the field. However, given Blackmon’s current indefinite suspension, and laundry list of legal problems, it is hard to know just what his future is with the Jags. At the very least he will not be around this season, and if Brown can stay healthy, he has a ton of opportunity to demonstrate to this coaching staff he deserves more reps. While Jacksonville is no longer the winless laughingstock of the league, they will still likely be put in the position to play catch up more often than not. That will mean plenty of passing. 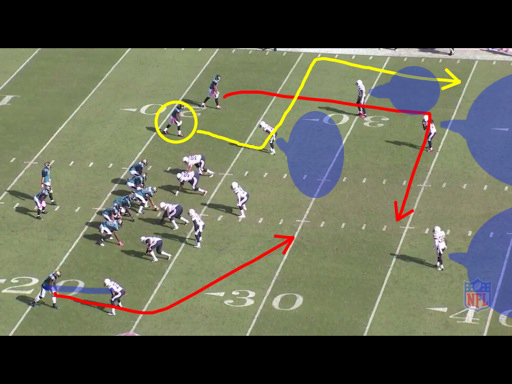 Mike Brown should be able use the vast array of skills broken down in this article to make plays for the Jaguars the rest of this season, and beyond. Despite drafting Ace Sanders and Denard Robinson, another converted quarterback, the Jaguars could have one of the better slot receivers in the NFL in a couple of years already sitting on their roster.